Tracker Mobile to support Blackberry and Android phones? We've had notification that Pocket PC Creations (the software we use to create Tracker Mobile) is due a major upgrade. We are partners with the company that produces Pocket PC Creations (known as PPCC) and so we are asked for our input to new versions and we get to test them before they go on public release. Up to now, PPCC has only support Windows mobile devices. They are hoping in the new release to also support Blackberry phones and the new Android devices too. They may even be able to support Nokia phones running the Symbian operating system. No specific release date yet for the new software but we'll update you as soon as we know. Google Maps (maps.google.com) was a revelation when it was launched and they soon followed with a mobile version for phones and pocket PCs. For a while, you have been able to request directions but it wasn't designed to be used "in car" as it didn't have voice instructions and the features you'd expect from a Sat Nav like TomTom or Garmin. Another fun day for Tim and Elaine at the Toy Library event on Monday. 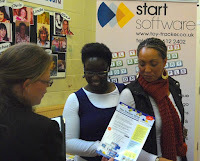 Thank you to all concerned for making us feel so welcome and for allowing us to demonstrate what Toy Tracker can do. You see photos from the event here (scroll down towards the bottom of the page). Tracker Web Server now logs the IP address of the connecting computer within its audit trail. Some client administrators have reported hacking attempts (though none have been successful due to Tracker Web Server's inherently secure architecture) and this new facility means that the IP addresses of hackers can be reported to the appropriate authorities. For more information, contact the office on 0845 612 2402. We've created a new, better version of Tracker Upload Manager, the program that sorts and confirms delivery of incoming survey data from pocket PCs. a new option which enables specific survey milestones to be auto-updated when data arrives. If you use Tracker Upload Manager, contact us for a free update. Microsoft have released Service Pack 2 for Vista. I have installed it and all seems well so far - my laptop is probably starting up and shutting down slightly more quickly and so far nothing has stopped working. If you have automatic updates switched on, your PC will prompt you to install it. Be warned - it does take an hour or so to apply. If you want to download it manually, take a look at http://support.microsoft.com/kb/935791 for more information. Kim has finished putting the Tracker manuals online. If you need to download the latest copy of the manual, click here. 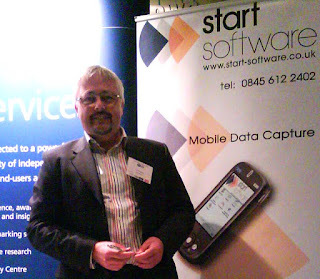 Tim is just back from the NCC Annual Conference at The Cumberland Hotel in London where he was discussing Start Software's expertise in mobile data capture with delegates from across the UK. Microsoft loses T-Mobile "Sidekick" customer data - for ever? Take a look at http://gizmodo.com/5378805/t+mobile-sidekick-outrage-your-datas-probably-gone-forever?skyline=true&s=i. This is an example of where "cloud" computing (where a unknown server somewhere is holding data on your behalf) can go horribly wrong. When Microsoft bought the company running the T-Mobile "Sidekick" service (a company ironically called "Danger") for $500m they presumably asked if appropriate backups were in place. They apparently weren't, and now their customers have lost everything (photos, contacts, messages) with no way of getting the data back. If you use any cloud service (eg Google Docs or Zoho) then do make sure you have a local backup of your information, just in case. 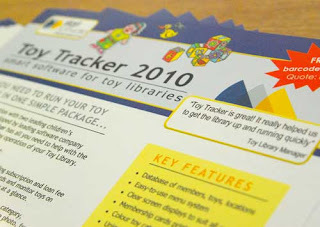 Tim and Elaine, our sales & marketing team, launched Toy Tracker 2010 at the National Association of Toy and Leisure Libraries (NATLL) Conference 2009 at Kings Cross, London. We had a great day at the conference and thanks to NATLL for their help and support in providing us space for our stand. Windows 7 is nearly here - the first PCs running the new operating system will be sold this month. As a Microsoft Partner, we get to see new versions of Windows early (when they are in "beta") and so we've been testing our software for some while now on PCs running Windows 7. The good news is that all of our software has operated correctly so far and although we will continue to run checks we don't anticipate any problems. This means that you can update your PCs whenever you want, confident that our software will continue to run. If you have any particular queries or questions, please do get in touch. Last night the Shropshire Police Authority members had our regular 6-monthly meeting with the Divisional Command Team. It is a chance to sit around the table and have discussions about any current issues, and we certainly covered a great deal of ground in nearly 3 hours of talking. We looked in detail at the crime levels and - in general - it is good news. Crime in Shropshire continues to fall, in general. It also seems that the recession has yet to make any negative impact on the number of burglaries, for example (it was expected that this sort of crime would rise, nation-wide). We also look at some of the "repeat offenders" how have been released from prison back into the community. The work that the police do to monitor these people is very important and very impressive. The officers also gave us an update about the working that Community Support Officers in particular are doing to increase community confidence in specific "hotspot" areas. This is really good work and we will continue to monitor it. Unfortunately, there have been some especially serious crimes of late in Shropshire and we were briefed on those. It is reassuring that Shropshire continues to be a very safe place to live, work and visit and in the rare occasions that a serious crime occurs, detection and conviction usually follows very quickly. Are you a talented software developer with MS Access, VB/VBA and SQL Server skills? If so, contact us and email your CV and a covering note. We are looking for someone to join our team and have a vacancy advertised on Monster.co.uk and in the local press. Just returned from a site visit to a Nuclear Power Station (they are upgrading their asbestos system to our own Asbestos Tracker). Many of the UK's reactors are approaching the end of their working lives and so the process of dismantling them is about to start and the proper management of asbestos containing materials will be a key part of the task.